Let There Be Life is puzzle game available for PC from husband and wife team Backward pieS. 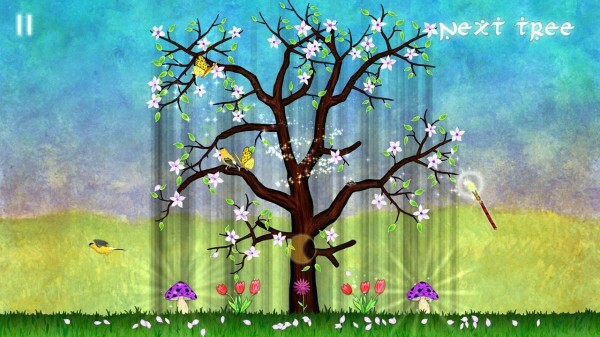 Originally developed for Edge Online’s Get Into Games Challenge 2013, the game tasks players with attaching branches to a tree trunk. The branches will insure the tree’s health, but too much shade can kills the flowers below. If a flower dies, you fail the level and will have to start all over again, according to IndieGames. Mushrooms, also present in the game, love the shade and will grow in size with it. When a mushroom reaches full size, it will glow and provide flowers with a one-time regeneration to full health. The site states that keeping flowers alive in Let There Be Life isn’t “challenging” but is relaxing, and contains lovely art and music. It also provides the player with a creative outlet. Let There Be Life is available for PC and will run you $7.99 through Desura, IndieGameStand, and a Humble Widget. The game is also up on Steam Greenlight and those who purchase the title will be handed a Steam key should it be greenlit. An Android version is currently in the works with Mac and iOS versions planned for release later this year.